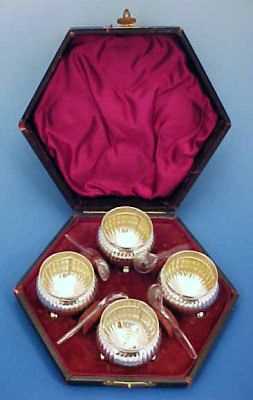 Outstanding set of four antique silver plate footed open salts or salt cellars in a fitted leather case, made by Thomas Latham and Earnest Morton of Birmingham, England c. 1866 - 1896. 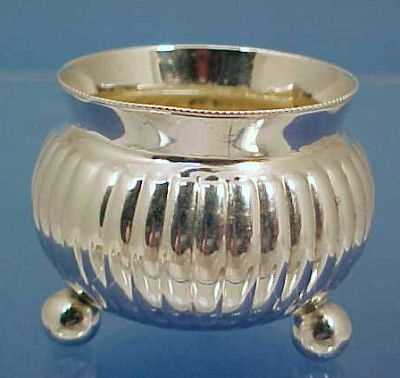 Each footed silver salt or salt cellar features a tiny beaded rim, lobed sides and four round ball feet. All have been used to some degree, and the insides of each salt cellar shows varying amounts of wear and discoloration. The outsides and the bottoms are in pristine condition. 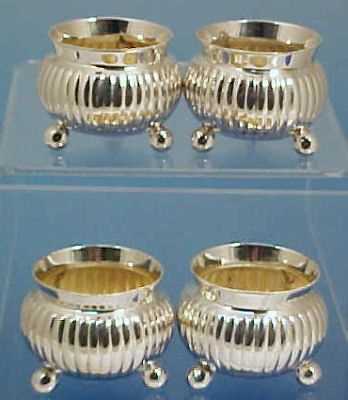 Each silver salt cellar measures 1.5" tall, 2" in diameter and each weighs 1.4 ounces. 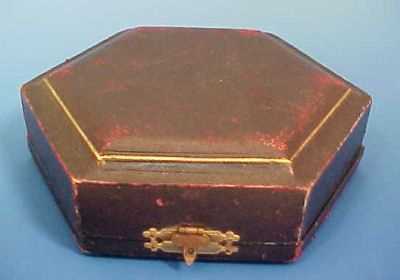 The hexagon shaped presentation box is lined in a padded royal purple silk in the lid and a royal purple velvet in the bottom. This presentation case is is fitted for each salt cellar, and has four slots for what we assume were the original silver salt spoons - now lost. (We are enclosing a set of 4 clear replacement salt spoons at no charge.) The salt cellar presentation box is quite worn on the exterior, but the original hinge and front brass clasp are fine and in working order. 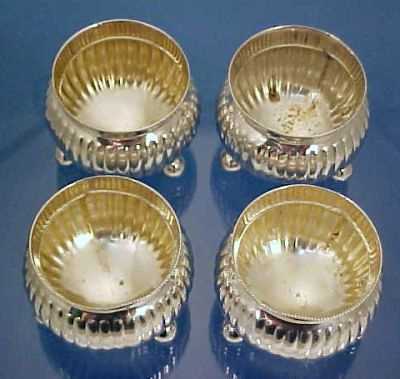 Each antique English silver salt cellar is touchmarked on the bottom with the touchmark for THOMAS LATHAM & ERNEST MORTON of Birmingham, England, which the marks indicate the date of 1866 - 1896. 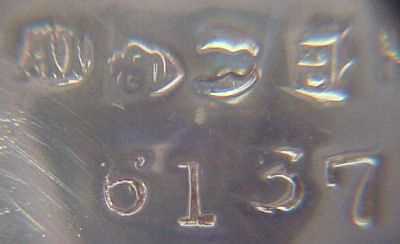 A photograph of the touchmark is also shown, as it was so difficult in getting the proper magnification for a photograph of the touchmark itself since the bottom is so small and rounded.